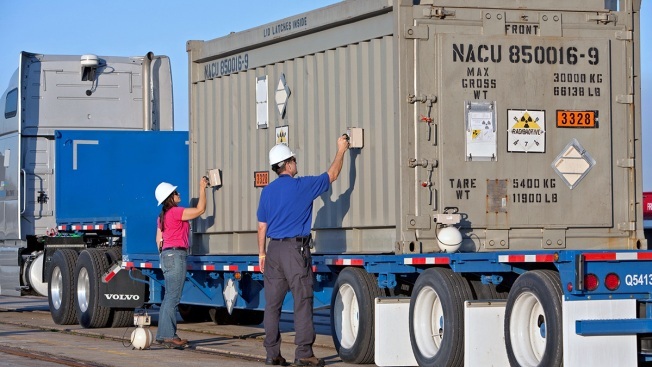 In this March 19, 2010, file photo, two employees from the National Nuclear Security Administration use gamma detectors to test the outside of a container of highly-enriched uranium for surface contamination at the Charleston Weapons Station near Goose Creek, S.C. The provision would have removed the National Nuclear Security Administration from direct control of the Energy Department. A report supporting arguments for the agency's independence said it has been plagued by cost overruns and weak accountability. Trump and lawmakers from both parties opposed the nuclear provision, but it was included in a defense bill passed by the Senate in June. Congress is abandoning an effort to loosen Cabinet control over an agency responsible for securing the nation's nuclear weapons stockpile. A provision in a defense policy bill would have removed the National Nuclear Security Administration from direct control of the Energy Department, where it's been housed since its creation in 2000. The provision was dropped as House and Senate lawmakers negotiated a compromise defense bill, aides said Monday. The defense bill could come up for a vote in the House this week. 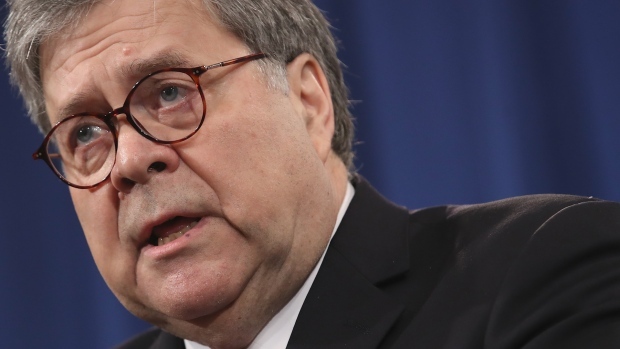 The Trump administration and senior lawmakers from both parties opposed the nuclear provision, but it was included in a defense bill passed by the Senate in June. The measure would have empowered the NNSA to act nearly on its own, freed from what a report by the Senate Armed Services Committee calls a "flawed DOE organizational process" that has led to "weak accountability, ... insufficient program and budget expertise and poor contract management." That report cites a series of delays and cost overruns at the agency, including a contentious project to reprocess weapons-grade plutonium and uranium into fuel for commercial reactors at a site in South Carolina. The White House and Energy Secretary Rick Perry oppose the reorganization, saying it would usurp Perry's authority to set policy in crucial areas. The bill also would make the nuclear agency's general counsel independent of the Energy Department's legal division. Shaylyn Hynes, a Perry spokeswoman, called the plan "misguided" and said it would "weaken national security efforts by limiting DOE's critical role in managing America's nuclear weapons capabilities." "It is in the best interest of the safety and security of all Americans to remove this provision from the bill and continue NNSA to be represented by a Cabinet-level official, allowing DOE and NNSA's complementary relationship to remain strong," Hynes said in a statement before the provision was dropped from the defense bill. The NNSA also opposed the change, saying it could "lead to unnecessary duplication of effort at NNSA for work already being carried out by DOE." Criticism of the nuclear agency isn't new. A congressional commission led by a former Army undersecretary and retired Navy admiral concluded in 2014 that it had failed in its mission and relied too heavily on private contractors that had turned it into a massive jobs program with duplicative functions and a "dysfunctional management and operations relationship." Perry told Congress this year that there have been "historically questionable expenditures of dollars" by the NNSA, including at the South Carolina nuclear project, but he said officials were working to ensure taxpayers "are getting a good return on our investment." Perry has moved to cancel the South Carolina project, known as the Mixed Oxide Fuel Fabrication Facility, but it remains open — at a cost of $1.2 million a day — amid a legal challenge by the state. The project's cost has ballooned from $1.4 billion in 2004 to more than $17 billion, and completion is decades away.